BAY SKIFF 15 versatile combination of sailing and rowing qualities. She is very easy to rig for sailing and is easy to handle by those learning the ropes. She is the right size for a family of two adults and two children. Construction is plywood and epoxy with just enough traditional details to make the project rewarding when finished. She is built skiff style by bending the sides around the frames ant fastening the bottom to a pre-attached chine. This little skiff is being taught as part of WoodenBoat's boat building school this year. A hull kit is available for this fine little skiff. So there are no excuses not to get started. Estimated cost for quality construction materials (not including power or sails) is $2400. This cost includes a high level of outfit and finish you can be proud of after putting the effort into building this fine boat. Purchase and Download Study Plans for the BAY SKIFF 15 for $5.00 in PDF format (zipped file). 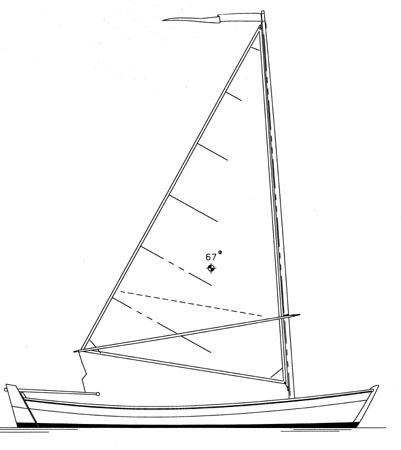 Purchase Construction Plans for the BAY SKIFF 15 for $70.00 for delivery by US Postal Service.